The Initial Damage Analysis step involves a thorough inspection of the damaged vehicle. This step is often done by the shop estimators, Jerry or Chad Crone and the insurance adjuster/estimator. A list of the damaged parts is then entered into a computer for final calculations. Crones uses CCC Estimating Systems for state-of-the-art accuracy. A Tech removes the damaged parts from the vehicle. At this point another inspection is completed to locate previously hidden damage. Once the damaged area is opened up, it is common to discover damage that was not visible during the initial inspection. If hidden damage is found, the insurance company will need to be notified and additional parts may be needed. Damaged Structural parts are repaired or replaced at this time. Master Technician, Danny Purnell utilizes state-of-the-art structural repair and diagnostic equipment. Chief EZ Liner and state of the art Laser measuring systems are used to ensure your vehicle will be repair to factory specifications. After the structural work is complete, the non-structural work is done. This includes body and mechanical parts replacement, dent repair, and panel alignment. When the vehicle is properly prepped it is moved to one of our two paint booths by Garmat or Binks. These state-of-the-art paint booths helps reproduce the look of a factory finish. Once in the booth, Head Painter, Mike Rabe applies a quality finish that requires an artistic touch. The vehicle is then given a “mini” detail including cleaning and vacuuming the interior, washing the exterior, and cleaning the wheels, tires and windows. After the cleaning, Jerry or Chad gives the vehicle a final inspection. 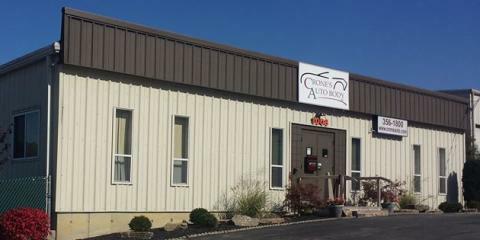 Crone’s Auto Body uses paint and materials from major, nationally recognized manufacturers including PPG, and the 3M Corporation. We offer our customers a range of extra services such as , pinstriping, door edge guards, side moldings, wheel opening moldings and glass replacement. 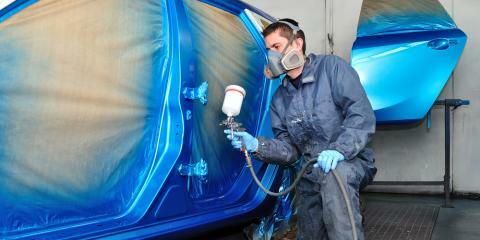 We use highly trained technicians, specialists in sanding, masking, painting, detailing and body repair. Our staff is trained and Certified to insure that repair and refinishing are completed to industry and manufacturer’s standards. Our shop is conveniently located off the I 275 interchange at Rt 17.And we are open Monday- Friday 8 -5 without an appointment. 1. Somebody told me that most cars don’t have frames, is this true? Yes, most cars have a unibody structure which require special repair techniques. It is extremely important to have your unibody vehicle repaired properly. Improper repair techniques can be a serious safety hazard. Our technicians recieve advanced training on a continual basis to assure that your vehicle is repaired to the highest industry standard. 2. Are Crone’s technicians experienced? Our technicians are very experienced and have a high level of training. We take pride in continuous improvement and cutting edge training. 3. 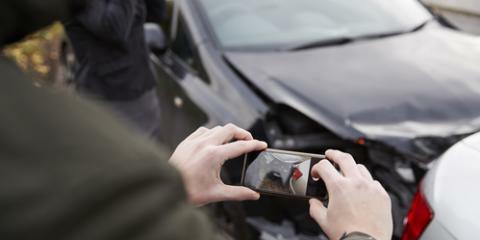 What should I do in case I’m involved in an accident? 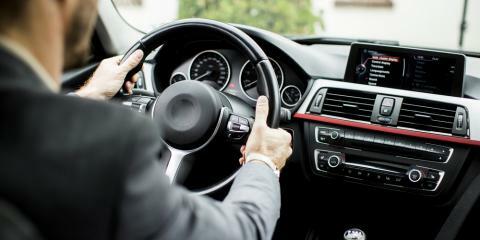 On average, you will be involved in a traffic accident once every six years. It is important to know what to do in case of an accident. Click here to find out what to do in case of an accident. 4. How many estimates do I need? 5. How long will it take to repair my car? 6. After my car is fixed will it be safe to drive? Yes. We are a Gold Class repair facility. This means we have state-of-the-art equipment and some of the most highly trained technicians in Kentucky. We also use quality parts and materials during the repair process and all vehicles are restored to factory specifications. 8. Do I need to make an appointment for an estimate? 9. Do you have rental cars available? No, we do not provide rental cars but we typically partner with Enterprise if a customer is in need of a rental. 10. Will my car look the same after repairs? We take pride in repairing vehicles to pre-accident condition. All repairs will meet or exceed the manufacturers specifications and all repairs are backed by a lifetime warranty. Crone's Auto Body We Appreciate You! Crone's Auto Body opened in Lakeside Park on Butttermilk Pike, on January 23rd, 1949. The company was started by Carl Crone and his wife Rita. Carl started this dream with more than just an idea, he was a true visionary. He saw the business as more than just a paint shop, to him it was generational. He and his wife Rita worked in tandem to launch what is now a 3rd generation business. Our reputation for Quality at Moderate Cost was firmly established in the Crescent Springs area in these early years and continues to a vital core value. © Crone Auto Body. All rights reserved.